CARLSBAD, Calif.--(BUSINESS WIRE)-- Spinal Elements, Inc., a Carlsbad, CA-based spine technology company, today announced FDA clearance for claims related to the macro-, micro-, and nano-surface structure of its Ti-Bond® surface coating technology. Highlighting Spinal Elements’ portfolio are a number of products featuring Ti-Bond, including the most recently introduced Lucent® XP height- and lordosis- expandable interbody device. Interbody fusion products featuring Ti-Bond technology are comprised of a PEEK body which provides the favorable modulus and imaging characteristics surgeons have come to trust while the multi-structured Ti-Bond-coated surfaces are designed to provide a favorable environment at the vertebral endplate. Since its initial introduction in 2012, products featuring the Ti-Bond surface coating technology have benefitted tens of thousands of patients. 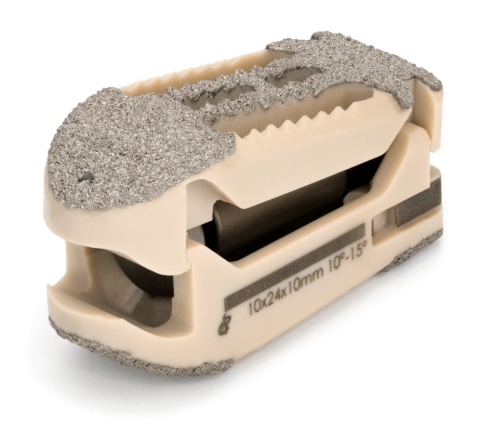 Ti-Bond was one of the many innovations introduced to the spine fusion market by Spinal Elements. Since its introduction, other technologies have emerged, each with their own compromises when considered for fusion. Ti-Bond allows the spine surgeon to have the latest, proven technology without compromising imaging characteristics, spinal loading conditions, or long-term performance. This clearance further demonstrates the complex surface environment provided by Ti-Bond coating adjacent to boney structures. Spinal Elements is a technology-driven company headquartered in Carlsbad, CA. A leading designer, developer, manufacturer and marketer of innovative medical devices used in spinal surgical procedures, our mission is to combine leading medical device technologies, biologics and instrumentation to create positive surgical outcomes that exceed surgeon and patient expectations. For more information, please visit www.spinalelements.com.